By Deborah Snow and Sarah Whyte from SMH. Chris Moraitis, the recently appointed head of the federal Attorney-General's department, comes across as a quietly spoken man. But he was visibly agitated after giving testimony before a turbulent Senate estimates committee in Canberra on Tuesday morning. Huddling with departmental colleagues during the morning tea break, an angry Moraitis was overheard saying "Mate, I need a scotch", after evidence put before senators that morning, in which the president of the Australian Human Rights Commission, Professor Gillian Triggs, detailed what she'd interpreted as a government request – conveyed by Moraitis – for her resignation. A seething Moraitis told companions he felt his integrity was under attack. But if there were wounded feelings and anger on his side, there were equally on hers. Even by the often robust standards of Senate estimates hearings – when parliamentarians get their chance to grill public officials – Tuesday's proceedings were a stormy affair. Some government senators were openly contemptuous of Triggs, while Moraitis came under unrelenting pressure from the Greens and Labor. "You could cut the tension with a knife," says one observer, who noted that Attorney-General George Brandis and Triggs did not look at each other as the session broke for morning tea, each turning away from the witness table to confer with advisers. Normally estimates committees grind away in the background of parliamentary business. But this one has the potential to derail some high-profile careers – even, possibly, Tony Abbott's. Several backbenchers contacted by Fairfax Media at the end of this week were in despair at his handling of the Triggs affair, including some who quietly share his and Brandis' view that Triggs displayed partisanship in the timing of her 2014 inquiry into children in detention. "The cabinet are getting spooked by [Abbott's] handling of the Triggs matter," one said. Another claimed more than 15 backbenchers had quietly congratulated NSW MP Craig Laundy for having the "guts" in the party room on Tuesday to question the government's shrill response to the children in detention report, which was tabled on February 11. "The government should have been highlighting the success of its policy in stopping the boats, which had very effectively reduced the number of children in detention, rather than leading a personal attack on Triggs", the source said. There had been a good news story to tell, but Abbott hadn't told it. Aside from unease over Abbott's full-frontal attack on Triggs, the glaring fact remains that she and Moraitis have directly contradicted each other on key points about their fateful meeting at the commission's headquarters in Sydney on February 3. Both acknowledge that Moraitis conveyed a message from Brandis that the government had lost faith in Triggs as commission president. Triggs told the committee: "The word resignation was absolutely crystal clear to me." She said Moraitis seemed " very awkward and embarrassed" and the exchange left her "very shaken and very shocked". But Moraitis told the committee: "I did not use the word resignation ever." He does admit telling Triggs that if she moved on, another government position could be available to her. "[Brandis] was asking me to formally put on the table or mention that there would be a senior legal role, a specific senior role, that her skills could be used for." He also indicated that Triggs already knew of the position, which surprised him. Pressed on what the mysterious role might be, Moraitis said it would not be "helpful for Australia's interests" if it were revealed. At no point did Brandis deny this part of Moraitis' evidence about an alternative "role" being "on the table", though he had plenty of opportunities to do so. Adding to the murkiness is that Moraitis admitted losing the notes that might back up his version. (He says they were on a notepad in a briefcase which he emptied before going overseas and that now he can't find them.). Turning up the heat on Moraitis, Greens senator Sarah Hanson-Young asked him pointedly at one stage if he was "familiar with section 7.6 [Bribery and related offences] of the Criminal Code." Moraitis replied: "No, you can read it to me if you like." Labor is intent on characterising whatever transpired between Triggs and Moraitis as the offering of an inducement to an official, which could put the exchange in interesting legal territory. But the government is equally insistent nothing improper occurred. Julie Bishop was adamant in Parliament there was no resignation request and no "offer", though she conceded that "a role was raised ... that related to international affairs". Asked about the difference between a "specific role" and a " job offer", she said, "it depends on who raised the issue of a role". Meanwhile government backgrounding to the effect that Triggs sought to be "looked after" if she resigned was furiously denied by Triggs on Thursday night. Brandis claimed in estimates on Tuesday that he'd been told by "numerous" sources within the commission that Triggs was taking counsel about her position and was worried about "reputational damage she might suffer if she resigned or stood aside". This was flatly contradicted on Friday by Triggs who told Fairfax Media "I deny any suggestion that I canvassed my future with other members of the commission at any time." That the affair is playing into what could be the end game around Abbott's prime ministership became clear when Communications Minister Malcolm Turnbull chose to effusively praise, not bury, Triggs this week. Tensions between ministers and the boards of statutory authorities arise from time to time. Indeed Turnbull's own recent issues with the ABC and the former board of the NBN come to mind. But Canberra hands can recall nothing quite so ferocious as the assault the government has launched against Triggs, with Abbott effectively accusing her of "stitching up" his government with the children in detention report. Brandis couldn't have made it any clearer on Tuesday, telling the estimates committee that by Christmas it had become "obvious to me that Professor Triggs ... had lost the confidence of one side of Parliament". Former disability commissioner Graeme Innes, who worked with Triggs prior to his departure from the commission last July, told Fairfax this week: "In my view all these things point to a [government] decision being made in about January that the best way to deal with the inquiry report was to shoot the messenger, undermine Gillian, and hammer her in the media until she resigned so that the government could then make a partisan appointment to replace her. It is such an abuse of the rule of law that I am incredulous about it." 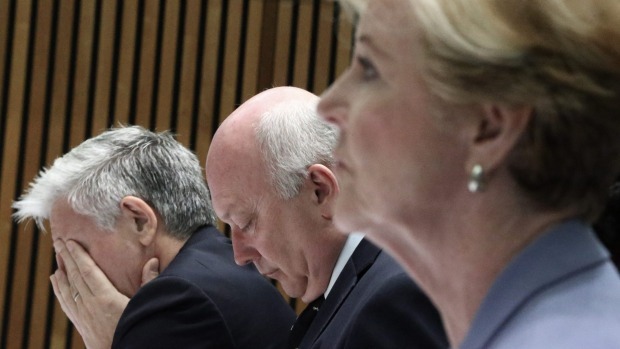 There is a longer backstory to the stoush between Triggs and Brandis. The immediate flashpoint is the commission's inquiry into children in detention, which the government argues was blatantly partisan because she launched it soon after the Coalition came into office, rather than during the Labor years when child numbers in custody were at their peak. Triggs says she decided to wait until after the 2013 election for fear of running into the caretaker period of government. But the government's claim that she was out to "stitch it up" gained some support when a former human rights commissioner, Sev Ozdowski admitted he found the timing of last year's inquiry "odd". Yet strains between the government and the commission were already apparent very soon after the 2013 election, when Brandis appointed right-winger Tim Wilson to the body as "freedom commissioner" without advertising the job. Publicly Triggs copped it, but privately many inside the commission felt Wilson was woefully underqualified for the job. Late last year, Triggs passed Brandis the draft report on children in detention. Soon afterwards, a series of negative articles about Triggs and the commission began running in News Corp papers. They especially honed in on Triggs' June recommendation that an Indonesian refugee and convicted killer, 51-year-old John Basikbasik, be allowed back into the community and receive $350,000 in compensation as a result of his arbitrary detention. Abbott described the decision as "extremely questionable". Alarmed, Triggs got in touch with Moraitis in early January to sound out why Brandis was not defending the commission, and what his view of her was. On February 2, Brandis got back to Moraitis, telling him Triggs had lost the confidence of government. Whatever the rest of that disputed message entailed, Moraitis felt it was so important he had to fly to Sydney to deliver it to her in person. On Wednesday this week, the day after dropping her bombshell before the estimates committee, Triggs and her fellow commissioners trooped back their Sydney headquarters to find staff had laid on a surprise morning tea. They applauded as she entered the room. "It was a bit emotional," one source said. "It felt like a family who had had something traumatic take place. It was an opportunity to show that we were all in this together, and that that we are really proud of the work we do."